Keep your smartphone, tablet, smartwatch, and portable battery packs charged, organized, and ready. This charging system from Skiva offers seven USB ports, which should plenty for most. Its slots are thick enough to accommodate tablets or smartphones, and each port outputs 2.4 amps, so your devices will charge quickly. It also has safety features put in place to protect against overcharging. The XUNMEJ charging dock is a minimalistic aluminum dock that quickly charges your iPhone or iPad mini, AirPods, and Apple Watch. It will look great on any nightstand, and comes in black, gray, or silver to perfectly match your favorite Apple devices. If you're looking for a charging solution to take anywhere, this one from Vogek offers six ports, a portable design about the size of a hockey puck, and an attractive metal finish. 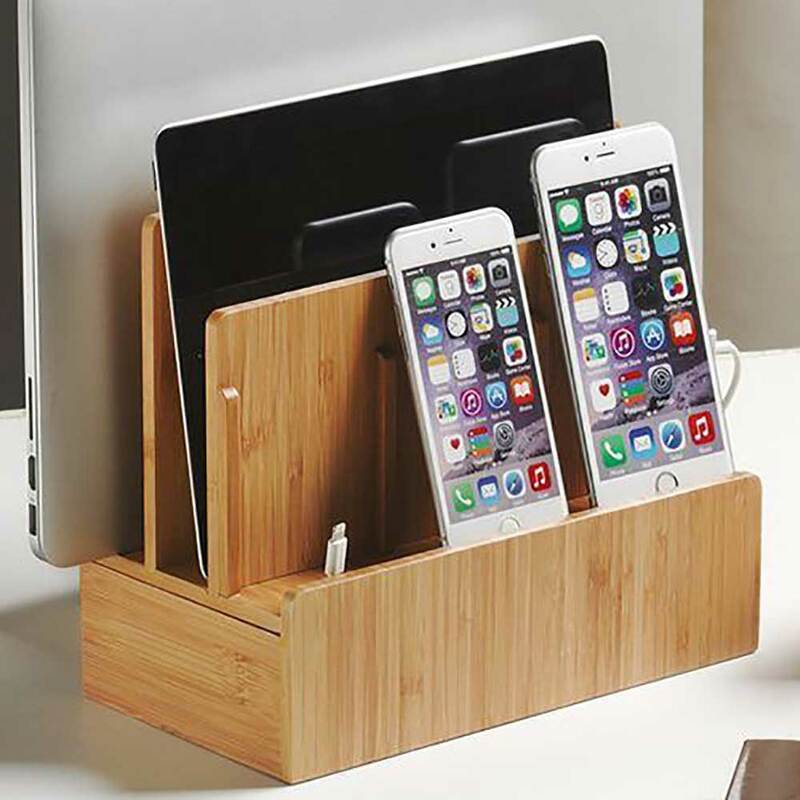 This bamboo charging station keeps everything nice and tidy. All your cables are hidden from view in a bottom compartment. The dock neatly stows a laptop, tablet, and three smartphones. Gadget aficionados will appreciate this charger's multitude of USB ports for refueling your tablets and smartphones. You can even adjust the width of the slots to fit thicker devices. Best of all, it outputs 2.4 amps of power, so it's one of the fastest charging stations you can buy. A desktop charging station is an incredibly convenient accessory to have around, as more devices that we use daily require recharging. Keep your smartphone, tablet, smartwatch, headphones, and portable battery packs charged, organized, and ready with one of our top-rated picks. We've researched hundreds of charging stations and chose the most powerful ones that provide 2.4 amps of current per USB port, so you can quickly recharge all your favorite gadgets. Most models we've recommended have earned a certification by the Underwriters' Laboratory (UL) Standard Technical Panel. This panel has analyzed charging stations’ construction, performance, and their electrical components to ensure that the devices won’t catch fire or overcharge your devices. It's worth noting that some charging stations don't include a power supply, and most of them don't include charging cables, either. You'll have to use your own Lightning or USB cables that came with your devices, or purchase them separately. For those models that don't include a power supply or any built-in USB ports, we recommend the Anker PowerPort 6. Its six ports each charge up to 2.4 amps, plus it pumps out 60 watts of power, and comes with an 18-month warranty. The PowerPort is compatible with the EasyACC 6-Port USB Charger Docking Stand, and the G.U.S. Multi-Device Charging Station Dock that we recommend. The PowerPort 6 is small enough to easily slide into these two docks, and it stays hidden so you don't have a tangled mess of cables. We also have reviews of smaller USB chargers that you may be able to use, too!